Mystery over why anyone is too excited over video of a large feral cat. 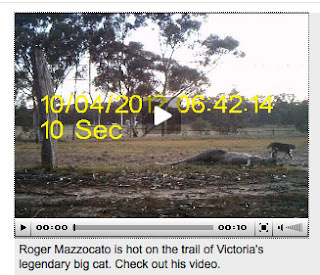 CENTRAL Victorian plumber Roger Mazzocato is hot on the trail of Victoria's legendary big cat. The 51-year-old shot this video using a motion sensitive camera in the Bealiba district earlier this month. "It is not the big cat but it is not a domestic cat, that's for sure,'' Mr Mazzocato said. He said the kangaroo had been gutted and its internal organs removed. Bealiba is famous as the home of the mythical "Bealiba Beast'' which terrorised the district late last century. "I have had glimpses of a big cat, like a panther in the area, it is definitely there,'' Mr Mazzocato said. "That is why I set up the cameras to catch it. The Victorian Government recently stirred up a controversy with its big cats study, saying there was no definite proof the big cats exist.